A vast and beautiful place, a country with red outback sands and multicoloured reefs. Among the indigenous outback, Australia presents a number of bustling cities that each offer a completely different experience. A country that is known for the Sydney Opera House, the Great Barrier Reef and a range of unique wildlife. 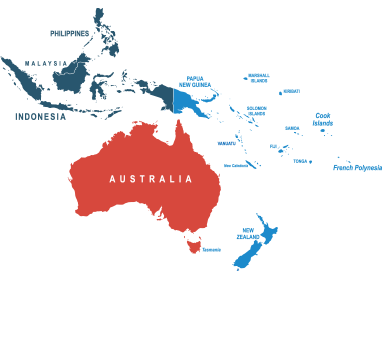 Although it is on the other side of the planet, DPD Local Online offers a great courier to Australia service. Don’t let the time difference put you off posting to Australia as DPD Local Online has an excellent reputation in delivering your parcels safely and on time. Our expertise in International shipping means that we are the best courier service to book with sending post to Australia. With our extensive delivery options, sending parcels to Australia has never been easier. DPD Local Online offers cheap and reliable services for a courier to Australia, so look no further as we have all the delivery options you need. Whether you are posting to the outback or the lively streets of Adelaide, we’ve got you covered when posting to Australia. Avoid any unnecessary fuss when sending your post to Australia, choose DPD Local Online to get the cheapest quote. Do I need to deal with customs when sending from the UK to Australia? Since Australia lies outside of the EU, you’ll be required to supply documentation for customs and import tax before shipping from the UK. Luckily, we’ve made it as easy as possible to ensure your goods are properly documented. Once your booking is complete, we’ll send you over all the correct forms you need to fill in to take that weight off your mind. Easy! How much does it cost to send a parcel from the UK to Australia? Postage to Australia costs as little as £13.37 when you book through DPDLocal-Online. And with plenty of options on all our services — including protection cover, signature tracking, and drop-off delivery — you can customise your order to suit you down to a tee when posting to Australia, or anywhere else for that matter. How should I address my parcel for delivery to Australia? By and large, Australia uses the same address system as the UK, so it should be fairly straightforward to address your package. Remember to put the state abbreviation (for example, “NSW” for New South Wales) on the same line as the town and the postcode, written between the two. For a more detailed breakdown of everything you need to know when addressing to Australia, you can check out this useful addressing guide put together by the Universal Postal Union. For any additional information on what can be sent to Australia, check with the Australian customs authority. You should also check out our prohibited items page for items that our couriers can’t legally handle.